I love lasagne. It’s bubbly cheesy goodness, it’s wonderfully savory sauce and all of its hearty comfort. Italian food feels very comforting to me. When I was sick, my Dad would always make me pastina with butter and cheese or lentil soup with pasta shells. My Italian grandmother is also a mean cook! Her lasagne actually has meatballs inside of it. Does that sound amazing? Yup. Yup, it is. Ever since becoming gluten free, I have not had this wonderful dish. I couldn’t find the motivation to create it with rice or corn or quinoa noodles. I felt like it would be a disappointment, and might turn out to be the mushy counterpart to my Grandmother’s lasagne. Don’t get me wrong, I do indulge in gluten free pasta now and then, and it can be quite tasty, but it can also be finicky and unfriendly. 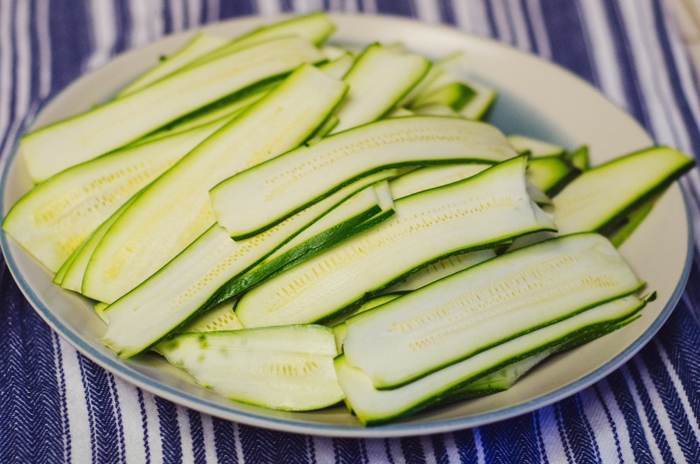 During the spring months I would grate up zucchini and turn them into noodles by sauteing them quickly and then slathering them with homemade pesto. They were always delicious, as well as healthy. It is the easiest way to scarf down a couple large veggies in one sitting. So, I started to think why not use it to create a lasagne? All I needed to do was to shave the zucchini with a mandolin to make long lasagne like noodles. BAM! Then I started on my meat sauce. I saute’d garlic and finely chopped onions in some olive oil, and once they were nicely cooked down added a pound of pasture-raised ground beef. I browned the meat and added two cans of Tuscan-style tomato sauce. Now, the key to any tomato sauce in my book is red wine. Lots of it. I don’t like my sauce to be sweet and love the rich savory taste you get from the red wine. Now, I love a meat sauce. I love meat in general. But, I am sure this dish would be equally good made vegetarian. Make your tomato sauce how you like and to your specifications—or you can follow me down my beefy wine laden path, because it is delicious. After your sauce is done simmering, lay some down in your lasagne pan. Layer up your pan. Sauce, zucchini, ricotta, mozzarella. You want to end with a layer of sauce and mozzarella on top. 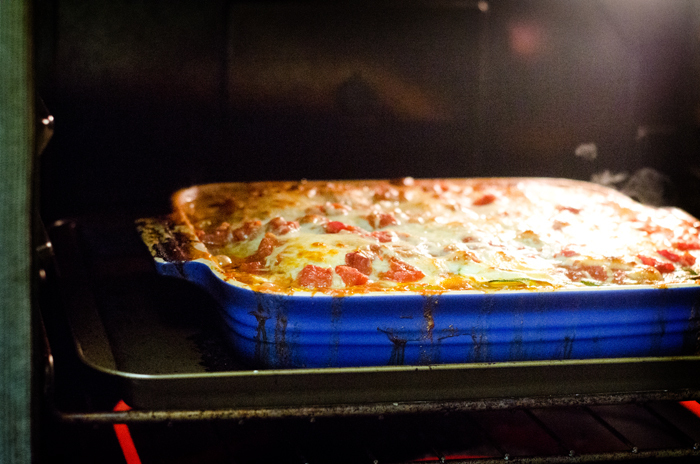 Pop it in the oven… lay back and watch the magic happen. It was so good my husband and I ate it for the next three meals. I am a firm believer in leftover Italian food for breakfast. Take out your large saucepan and coat it in a very thin layer of olive oil. Saute your garlic. Add in your beef. Season it to your liking and let it brown. I usually add salt, pepper and granulated garlic to mine. Once your beef is cooked through, add in your sauce and stir. Add in your wine. I usually just measure mine by feel… but, I am thinking it would be at least a 1/2 a cup. Let your sauce simmer as you prepare your other ingredients. I like to let mine simmer for 30 minutes or so. It makes all the flavors come together beautifully. Slice your zucchini with a mandolin approximately 1/8 thick. Cut it lengthwise so the slices are nice and long to mimic the shape of noodles. In a separate bowl, prepare your ricotta cheese mixture. Add in your ricotta and your egg. Mix together well until the egg is fully combined into your ricotta. Now, you can begin to layer your lasagne! 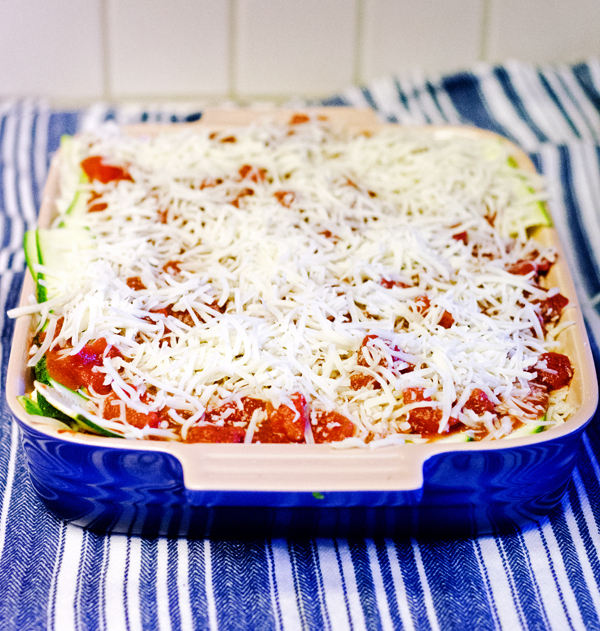 In your 9×12 baking pan, begin the layering process by putting down a thin layer of sauce. 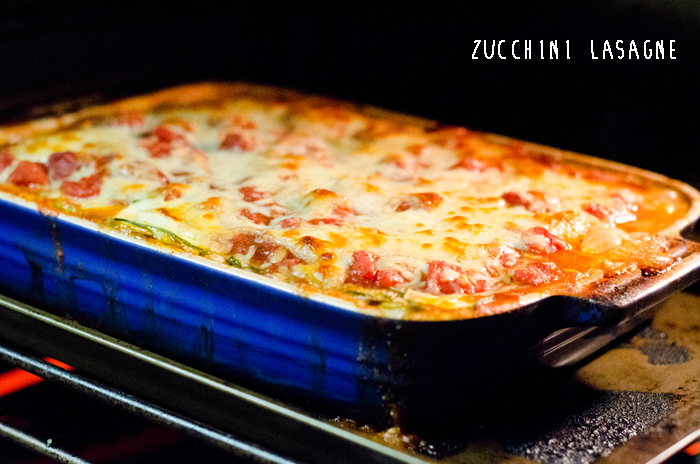 After that zucchini, ricotta and mozzarella Repeat this process until all of your ingredients are used up. Top it off with a layer of sauce and then mozzarella. Sprinkle your parmesean on top. Cover with tin foil, and pop into the oven for 45 minutes. Remove the tin foil and bake it uncovered for an additional 10-15 minutes, or until the cheese starts to brown and get bubbly. Once it’s done, let it rest for 10-15 minutes before serving. Dig in. Eat for two days straight. No regrets. Wow you’re making me hungry! great pasta-alternative… Still cozy comfort food. Need to find a mandolin asap! I’ve made this before also! And I was very surprised at how great it was! Normally I don’t like anything that tries to use vegetables to sub for noodles. But this totally worked.